While out to breakfast yesterday, I unexpectedly learned a new word, “polepole.” Though not exactly sure how to spell it, pole pole or pole-pole is Swahili and means “slowly, gently, softly, quietly, be calm, take it quietly, don’t excite yourself, take it easy.” It is a term my husband has acquired for his upcoming Mt. 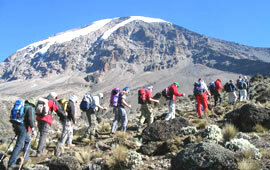 Kilimanjaro adventure with our son, Owen. Mountain guides frequently coach their hikers to go ‘pole, pole’ or ‘slowly, slowly’ as to assist in the acclimatization to the altitude changes. After thinking about this new word, it struck me that in a race to feel normal after breast cancer or any serious life event, many of us (including me) don’t go ‘polepole.’ We want to simply close one chapter and open the next, entitled, “my new normal.” But, infact, it doesn’t work that way. It takes planning and follow-through, goal-setting and set-backs to reach the other side of personal tragedy. Here is some of the wisdom compiled on my research journey up the aftercare mountain. In After Cancer Treatment it is made clear that another form of treatment begins after our last cancer treatment. An emotional and physiological healing process. There is a holistic approach to finding a “new normal,” and it takes some personal fortitude to figure it out. It is clear the building blocks of aftercare are diet, exercise, weight control, sleeping, pain management, follow-up appointments, and spirituality. Joseph Campbell is quoted in Dr. Silver’s book, “We must be willing to give up the life we have planned, so as to have the life that is waiting for us.” As I’m figuring out how to go polepole, I’ll try to slow myself down and acclimatize to where I am at this moment. I can always move up the mountain tomorrow.